The Woodlands Commentary: Eagles perpetuate their species - a project for The Woodlands. Eagles perpetuate their species - a project for The Woodlands. Isn't it amazing that our national bird has almost totally recovered from near extinction? It was not long ago in my lifetime that they were endangered, because we used insecticides (DDT) to "nuke" bugs and everything else that got in the way of raising crops or children. Finally, in 1962, "Silent Spring" by Rachel Carson, a biologist, was published. It revealed the effect of DDT on our environment. "Nuking" our mosquitoes was causing mass murder to the hummingbird population. DDT-polluted water was destroying even our national bird, in addition to water fowl and fish. Butterflies and other insects such as Fireflies were obliterated by DDT. As part of the food chain, humans were also getting poisoned little by little by this nervous system drug. The revelation in 1962 of the grave consequences of this chemical on the earth took another ten years to effectively act upon. It was so heavily used in the 1950's that virtually every living species was affected, including the American Bald Eagle. The shell of it's egg became very thin in the presence of DDT, thereby getting crushed when the eagles sat on them. (click to see full size) The Eagles of The Woodlands have been producing two eaglets every year for the last ten years. I am not aware of one year where they failed to produce two babies. Eagles live to be 30+ years old in the wild, potentially parenting about 60 Eagles. 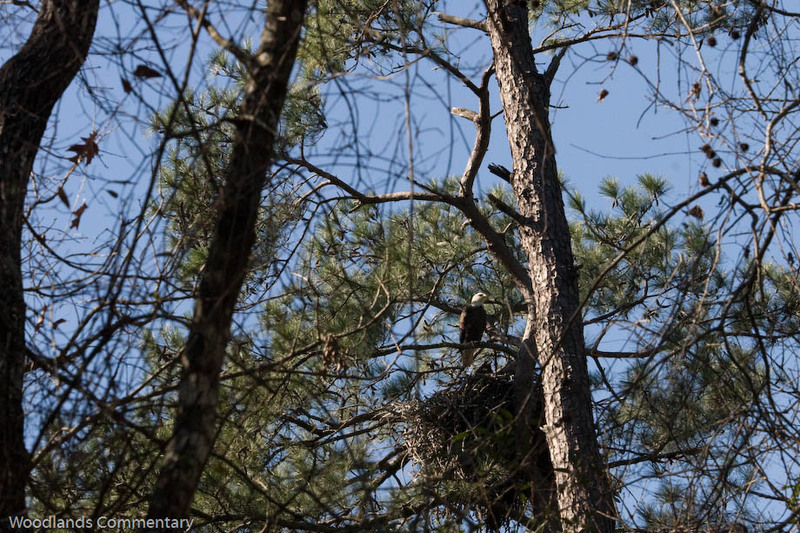 Why would an Eagle pick The Woodlands to nest? It is far enough south to provide a warm but not hot nest in the winter. Of course, we also have the trees that can support a nest weighing up to two tons. These birds do nest in pines here, but they are not limited to Pine trees at all. The critical requirement is to be near water, because Eagles are fishing birds. The other requirements include trees that can hold a nest, which weights as much as a car, and enough space for the parents to hunt, fish and protect their young in reasonable solitude. Eagles can spot a fish at a very high altitude and can go totally unnoticed by a fish near the surface. Lake Woodlands and presumably the reservoir on Kuykendahl both support Bald Eagle nests. These birds also need hunting space and forested protection, so that the parents can oversee the nest and protect the young from man, varmints and other birds of prey. Vultures are constantly watched and attacked when they approach an Eagle's nest. I have seen them chase other raptors away. The Eagles talk in the forest. They makes sounds that are unique only to them and tell each other when there is danger, where they are and what they expect of their mate. What a fitting species for our national bird! Strength, agility, speed, flight and domain attributes, skill and cunning, perception and beauty. Are not you proud this is our national bird? I am! And it lives right here among our trees for half a year! 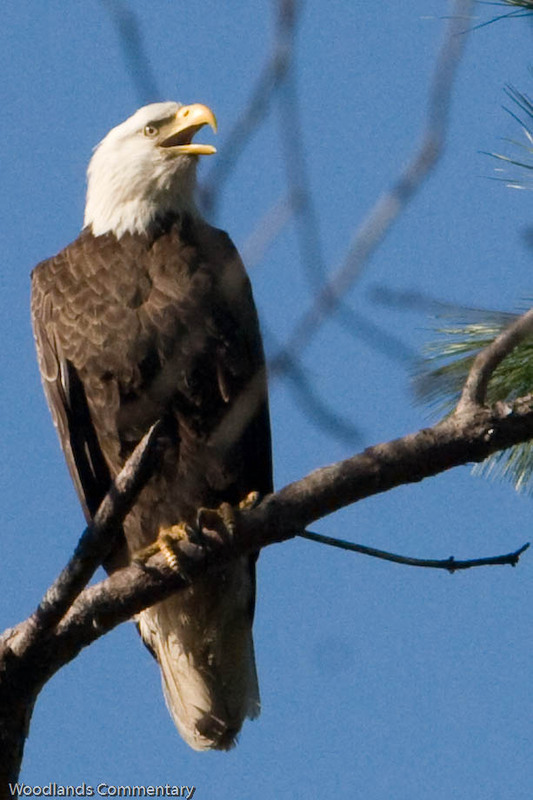 Bald Eagles are "bald" because they have white heads. This name apparently came from old grey haired men who identified baldness and white heads on humans as mature and cunning hunters. Anyone who has studied these birds are aware of their great hunting and fishing skills. I have watched them fish. With keen eyes and high speed flight, a fish will in one second be sun bathing and the next in the grip of Eagle claws. The Eagle Claw brand picked a suitable name for fishing hooks, because they are very effective! Fish are simply plucked out of the water with such skill, that you hardly see the water move except by movement of the fish. When an eaglet is trained to fish, he learns to do this by example. The adult will catch the fish and then after essentially disabling it, drop it with the eaglet following, which dives to pluck it up off the surface of the water. He is rewarded with a meal and the example and feel of the catch is set in his memory. There are video cams in various places in the USA and Canada, where nests are monitored and live telecasts via internet occur. 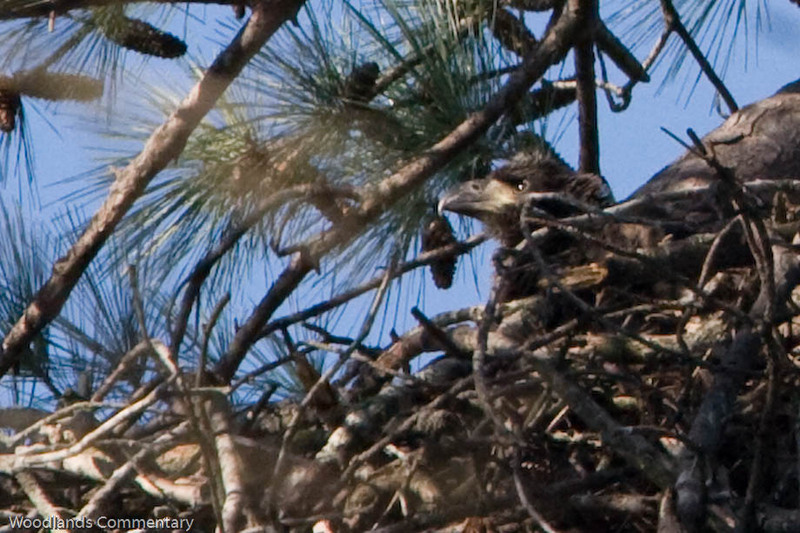 One can watch what occurs in an eagle nest and the process of caring for eaglets. A project to educate the public on the natural setting here is quite possible for The Woodlands, and little effort would not cost much money, but have high returns. The primary obstacle is the land use. My idea would be to have a video screen video on our waterway tourist boats to show the live broadcast and feeding stations of other wild animals in our forests. It would show our eagles live to visitors in the Spring and by recorded video at other times. Some creative thinking and ingenuity could leverage what we value and have here at our fingertips, and demonstrate that man and creature can co-exist, each in its unique habitat. To do that, we would need to change our collective attitude about wildlife here. These birds are an asset to us, but at risk to being displaced by development. We should be looking for help from conservationists in corporations or elsewhere to do this. It should be done now! Anyone want to help? As I have suggested before, I firmly believe that we have a few strengths to competitively draw commerce and visitation, and little of it is in concrete and steel. What is made with concrete and steel can and will be replicated down the freeway or highway or on the other side of the city. Everyone with any business insight will tell you to build on strength, not on weakness. The strengths come from the forest, its inhabitants and the natural creeks that meander through our villages. That is basis of what we are, what we have been and hopefully what we will be in the future. We are part of the East Texas forest system. The Bald Eagle nest is one of those very things that make us unique, right in the middle of town! The birds need their privacy, but visitors on one of our boats could spot an eagle any time in the late winter or spring without disturbing its rituals of nesting. Have you ever ridden one of these boats? Did you feel like you were in nature? That is what I am talking about. The foundation of this place has always been the forest and nature. I keep it close to my heart every single day of my life. Join me in pushing for nature conservation in Town Center!